A site visitor said, "I need a good allergy relief air purifier. What are some things for an allergy sufferer to consider when shopping for the best air purifier for allergy relief?" Never before was the phrase "buyer beware" more appropriate than in regards to finding a truelly effective allergy relief air purifier. Any air purifier comparison will prove that there are way too many "lemons" available on the market today and an air purifier by any other name certainly does not produce air that "smells as sweet", especially to an allergy sufferer. In fact, many air cleaners are real stinkers as far as efficiency and performance are concerned! So let me give you an overview of some points to consider when looking for that effective allergy relief air purifier needle in the very big air cleaner hay stack. First of all, for control of allergens you definately want a home air purifier with a good pre-filter to catch the largest particles like pollen, hair, or lint. A poor quality pre-filter will allow pore clogging particles to pass through to the HEPA or gas-phase filters. This will rapidly reduce the total air cleaning capacity of the unit by reducing the ability for air to pass through the purifier (reduced air changes per hour). Electrostatic air purifiers or those that depend on electrostatically charged filter media like those with Electrete filters will also see a rapid reduction in the ability to capture particles if a good pre-filter is not used. With out the removal of larger particles the charged plates of fibers become covered and the electrostatic attraction is greatly reduced or a fire hazard could even result in the worse case scenario. In order to catch the smallest and most damaging of allergen particles that make it through the pre-filter (and also most deeply into your lungs) your allergy relief air purifier should contain a high quality HEPA filter. HEPA stands for "high efficiency particle arrestor" and this is the part of air purifiers where the most tricks of the air purifier trade are employed. Since these smallest of particles (sub 0.3 - 0.5 micron) typically compose over 90% of the indoor air pollutants in your home and are also the most dangerous, a good HEPA filter that can remove them from your air is the most important component of truelly effective home air purifiers. If your air purifier's HEPA filter can efficiently catch vapors, tobacco smoke particles, viruses, bacteria, cat allergen, soot, dust mite allergen, roach allergen, house dust, or smog (also known as lung penetrating particles) you will usually have an effective purifier for allergen control. Unfortunately, all HEPA filters are not created equally and many of the most heavily marketed air purifiers either contain no HEPA filters or have poor HEPA filters that are just plain aweful at filtering out allergens. In fact, most standard HEPA air filters will not trap the smallest and most damaging of particles despite what the trumped up advertisements suggest. Common statements like "filters out 99% of all airborne allergens" are extremely misleading in most cases because the marketers are actually quoting the theorectical efficiency of the paper used to manufacture the HEPA filters. Once the paper is pleated and incorporated into the actual air purifier the total efficiency of the purifier often drops to as low as 80% because of damage to the HEPA media during pleating, lack of true HEPA media, or more commonly due to air leaking around the HEPA filter or filter frame and housing. This effect is known as "blow by" and is common to many air purifiers marketed for control of allergens. It is extremely difficult to find an allergy relief air purifier with the actual overall efficiency stated and even more rare to find one for which the efficiency has been certified and guaranteed. One of the few manufacturers we have found that does both is IQAIR. Another trick the manufacturers employ frequently is to overstate the clean air delivery rate (CADR). As one popular and heavily marketed electrostatic air purifier manufacturer states, "in order to clean air you have to move air"; however, the advertised rate at which many air purifiers move air is often misleadingly based on how much air the purifier fan motor itself can move, without the filters installed. Many advertisements state a room size but never mention how many air changes in that size room the home air purifier will actually achieve. This is another benchmark for which IQAIR rises far and above the rest with its certified and guaranteed efficiency and air changes per hour. Another favorite claim of room air cleaner manufacturers is to brag about ULPA filters. ULPA stands for "ultra low penetration air" and can theorectically filter up to 99.999% of 0.12 micron particles compared to 99.97% of 0.3 micron particles for HEPA filters. ULPA filter technology is common in clean room air cleaners and has the POTENTIAL to filter out more particles than HEPA filters. However, ULPA filters will actually make the total efficiency of home air purifiers lower than those which contain HEPA filters because the denser ULPA media allows 20% - 50% less air to pass through, thereby reducing the air changes per hour and causing less total particles to be captured over the same period of time when compared to HEPA filters. ULPA versus HEPA is a perfect example of how air changes per hour can be more important than the ability to filter slightly smaller particles. The trade off is in the air handling ability. So marketers desiring to use ULPA to claim the better mouse trap is yet another example of how allergy sufferers can be mislead and even harmed in the long run. Vapor or gas-phase filtration is an important component of an effective allergy relief air purifier because many allergenic gases like ammonia or formaldehyde are very common in indoor air yet are so small (less than .001 micron) that even the best HEPA filter will still not remove them. Many room air cleaners for allergen control are advertised as containing gas-phase filters and vapor filtration in the form of zeolite or activated carbon. Many even claim to filter ALL gases and vapors, a feat which is virtually impossible because specific gas-phase filters are needed for certain types and sizes of gases and no air purifier could contain all of them. Lower molecular weight gases like hydrogen sulfide, formaldehyde, or ammonia would only be removed by special chemical sorbents. Activated carbon vapor filtration wouldn't be effective for these gases. Worse yet, most vapor filters only contain a very small amount of actual activated carbon in the form of carbon fiber pads impregnated with activated carbon dust. Therefore, the few ounces of actual activated carbon typical to many vapor filters removes only very small amounts of a few vapors or gases. Another impressive sounding sorbent advertised for vapor or gas-phase filtration in allergy relief air purifiers is called Zeolite. Zeolite is a cheap alimina-based material often used as a base for making chemical catalysts. Zeolite is often claimed to effectively filter formaldehyde or ammonia gas; however, for home air purifier manufacturers it is mostly just a cheap filler which helps make their purifiers sound more impressive than they really are. There is little evidence as to Zeolite's effectiveness as a gas-phase filtration media in home air purifiers. Perhaps the best air purifiers for gas or vapor control are Allerair, Clarifier, and IQAir IQMultigas air cleaners. A newer technology which may be somewhat effective for reducing allergens from indoor air involves the introduction of Ultra Violet sterilizers to home air purifiers. Ultra Violet or UV light is high energy light waves which can damage the RNA or DNA of microorganisms commonly associated with allergies. While UV light may not completely kill the organisms, the damage to the genetic material within viruses, mold, or bacteria may render them unable to reproduce or grow. The effectiveness of UV sterilization in air purifiers is likely far from 100% efficient but may be worth having since it may reduce the dangers from biological air pollutants. The effectiveness of an UltraViolet air purifier will basically depend on how strong the UV light is (dosage) and also the length of time that biological particles are exposed to the UV light rays (exposure). The longer the virus or bacteria is exposed to the UV rays the more likely it is that genetic damage will occur, though some types of biological organisms are more resistant than others. Overall, UV air cleaners may be somewhat helpful for controlling some types of living allergens in indoor air but should be only one part of a good purification system for controlling allergens. Other newer allergy relief air purification technologies which may be partly effective for control of indoor allergens are known as "Air Sterilizers" and "Air Washers". Air Sterilizers use heat to destroy organic allergens like viruses, bacteria, and mold. An example of a brand employing this technology is Airfree. Air Washers clean the air similar to how a rain storm "scrubs" the air outside. The air is basically forced through water in order to capture indoor air pollutants. These Air Washers also introduce moisture into the room and so may act as a humidifier. An example of a brand of air purifier using this technology is Air-O-Swiss. Other air cleaner technologies for allergen control are known as electrostatic air cleaners or ionic air cleaners. A filterless air purifier like the Sharper Image Ionic Breeze uses electrically charged plates to pull air into the purifier and collect particles by ionizing them. Other whole house air purification systems or residential air exchanger may employ charged filters known as Electrete filters to attract particles using electrostatic attraction. Some ionic air purifiers ionize particles which can result in deposition on curtains, walls, furniture, or floors. This effect can be very undesirable. Another undesirable outcome of electronic air cleaners or ionizers may be the creation of a dangerous gas called ozone, also called superoxygen or activated oxygen. Ozone is a known allergen, asthma agent, and inhalation hazard. It is a major component of smog in cities and can cause severe respiratory irritation. Some devices known as ozone air cleaers are even designed to intentionally produce ozone! AVOID OZONE AIR PURIFIERS AT ALL COSTS! Commercial ozone air purification is effective at removing smoke odors from fire damaged properties; however, they should only be used by professionals in unoccupied structures. Residential use of ozone air cleaers has been implicated in serious health consequences for many people. Likewise, for those electrostatic purifiers that use charged plates, such as in the heavily marketed Sharper Image Ionic Breeze purifier, frequent cleaning of the plates is necessary to maintain the ability to attract particles. The more particles stuck to the plates the more electrical resistance and hence lower ability to attract particles. Some more examples of air purifiers advertised as controlling allergens and that use this technology is Hoover and some Hunter HepaTechs. Friedrich has some models of electronic air cleaners that use a similar electrical charge attraction of particles but prevent deposition on surfaces in the home. One final thing regarding electronic air purifiers to keep in mind is that the American Lung Association believes that ionized or charged particles are more likely to stay in the lungs when inhaled. The smaller the particles the more likely they are to be exhaled after being breathed in; however, if charged they may be more likely to attach to the surfaces of the lungs air sacs (alveoli) or bronchiol tubes rather than being exhaled. In conclusion, a good allergy relief air purifier should incorporate an effective pre-filter, HEPA filter, and gas-phase filtration. The more types of air cleaning technologies the better. To keep from buying one of the thousands of poor quality air cleaners its wise to be sure the air purifier is guaranteed and certified for efficient total removal of particulates. Taking all the above information into consideration the vanguard of quality for anyone suffering from allergies or asthma is definately IQ Air. The IQAir HealthPro is by far the industry leader and most units will not even begin to approach the effectiveness of these purifiers. 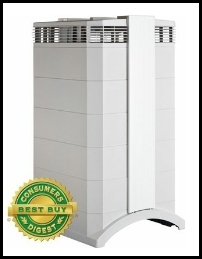 Also on a performance for purifier price comparison these are the best air purifiers for allergy relief money can buy. Of course an allergy relief air purifier is only effective if they are installed, used, and maintained properly according to the manufacturers' directions. Likewise, purifiers will only capture those allergens which are suspended in the indoor air; therefore, the most effective allergy control plans usually involve a good quality HEPA vacuum, steam cleaners, or other cleaning techniques to remove allergens before they become airborne. I hope you find this information helpful in your search for an effective allergy relief air purifier.